This paper is a bit of a departure for me, but even though it's not a microbiome paper it's still one of the most surprising and wonderful papers that I've seen in the last year, so bear with me. We're looking at Tucker, et al. 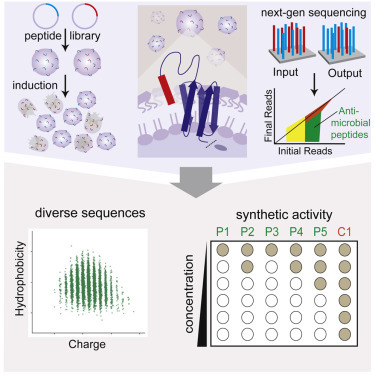 "Discovery of Next-Generation Antimicrobials through Bacterial Self-Screening of Surface- Displayed Peptide Libraries" Cell 172:3, 2018. (http://www.cell.com/cell/fulltext/S0092-8674(17)31451-4). When I first learned about this project, I said, "That's a fun idea, but it won't possibly work," to which the PI responded, "We've already done it." The extremely cool idea here was to rapidly discover new antibiotics by quickly screening an immense library of novel peptides. The diagram below lays it out: they created a library of peptides, expressed those peptides on the surface of E. coli, and then used genome sequencing to figure out which of those peptides were killing the bacteria. The overall method is called SLAY, which exceedingly clever. While this idea seems simple, there are more than a few parts that I thought would be impossibly difficult. They include (a) building a sufficiently large library of peptides, (b) expressing those peptides on the surface of the bacteria and not inside the cell, and (c) making sure that the peptides were only killing the cells they were tethered to and not any neighbors. I won't go through the entire paper, but I will say that the authors ended up doing quite a bit of work to convince the readers that they actually discovered new antimicrobial peptides, and that they weren't observing some artifact. At the end of the day it seems pretty irrefutable to me that they were able to use this entirely novel approach in order to identify a few new antibiotic candidates, which typically takes hundreds of millions of dollars and decades of work. In short, it looks like smart people are doing good work, even outside of the microbiome field. I'll definitely be keeping an eye on these authors to see what they come up with next!